1. Did we really need another Sir A. C. Doyle supersleuth adaptation? 2. How does every BBC miniseries I see manage to be so bloody good? The answer to #1 is quite dependent on #2. Because the 2010 series does manage to breathe fresh air into the cliche of the know-it-all-detective. First off, he is played by the divinely named Benedict Cumberbatch, who has the intense eyes and stare of a more twitchy Cillian Murphy. Watson, as any purveyor of pop culture knows, has his bowler hat filled by Martin Freeman, the UK’s Office‘s Jim, only he was called Tim. Instead of smirking his way through scenes, Watson is introduced with a scowl and a limp, fresh of a tour in the Middle East as an army doctor. He meets Holmes through a mutual police friend, they become unlikely roommates at 221B Baker Street, and zaniness ensues (of a sort)! There are only three episodes in the first season, so each are about movie-length. The thing about having a single mystery per episode is, as with Scooby-Doo, you know that the villain will be introduced at some point in the storyline. So some of the plot leaps get quite convoluted indeed. But there’s so much to make up for it. Holmes and Watson have great chemistry, especially for, as far as I can tell, the producers are keeping us guessing as to Holmes’ sexuality. There’s none of the Tarantino-esque bromance found in the Robert Downey Jr.-Jude Law variety. This is a slick, modern incarnation, with sinister text messages and designer sneakers. I’d say he makes a far better Holmes than Hugh Laurie as House (what, you didn’t realize that was a Holmes, too?) – we Americans give Laurie an award every year because we are so surprised he’s actually British. Sherlock is a bit more fun, too, with Cumberbatch is as slippery as an eel as he whips around London in his topcoat, with Freeman trailing behind. 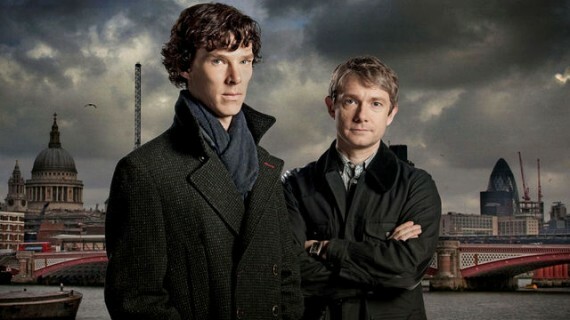 The second season is filming now, and should be available in Britain by the end of 2011. The first season is on Watch Instantly over on Netflix. Also, both actors will be featured in the Hobbit! On the tail of the royal wedding is probably an auspicious time to examine our particular fascination (as Americans at least) with the British aristocracy. The runaway success of the British series Downton Abbey confirms that this obsession still runs deep. When I heard of the series, I thought it was created just for me. I have written before about my love of the interwar time period in England. From Gosford Park to The Remains of the Day, I have come to adore the upstairs-downstairs dynamic (upstairs are the landed gentry; downstairs are the people that serve them). Downton Abbey actually begins right before World War I, with the sinking of the Titanic. Unfortunately for Robert Crawley, the Earl of Grantham, and his family, his heir and daughter’s fiance drowned when the ship sank. Now his three daughters and wife face the possibility of losing everything if he dies due to a pesky entail. What the show does so well is explore how people attempt to reconcile their personal desires with the social constraints around them. Both the Earl’s family and the servants that work for them must follow a set of archaic protocols. Dress for dinner. Lock up the maids’ rooms at night. Elaborate hunting parties (though I think those still happen). I’m not doing the best job of explaining the plot, but then again I don’t want to ruin it. Suffice to say, it is heavy with drama of seductions, plots, love affairs, covered up deaths, and (gasp!) ruined reputations. It’s currently streaming on Netflix, and has been renewed for a second season so I suggest catching up. One of the best things I’ve watched this year.